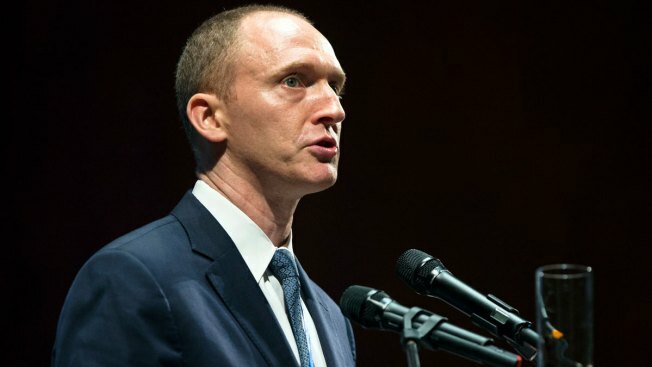 In this July 8, 2016, file photo, Carter Page, then adviser to U.S. Republican presidential candidate Donald Trump, speaks at the graduation ceremony for the New Economic School in Moscow, Russia. Former Trump campaign adviser on foreign policy Carter Page met with the Senate Intelligence Committee Friday for over five hours, NBC News reported. Page was subpoenaed by the committee to appear at the session which was closed to the public. NBC News reported that he did not respond to questions about being contacted by Special Counsel Robert Mueller. Page called the Russia investigation a "witch hunt that was sparked by the dodgy dossier in the months prior to November 2016," NBC News reported. Senate Intelligence Committee Chairman Richard Burr, R-N.C., said earlier this month that the intelligence committee had already conducted more than 100 interviews in its probe into Russian interference in the 2016 election, totaling more than 250 hours.